Mind the dots. At this month's Federal Open Market Committee (FOMC) meeting, all eyes will be on the quarterly Summary of Economic Projections. We discuss big potential changes to the FOMC members' expectations for the federal funds rate, also known as the "dot plot." Weekly highlights. "Green shoots" finally emerged in European manufacturing activity. In contrast, manufacturing in the United States hit a soft patch. The U.S. seems to be under little inflation pressure, for now. Investment implications. 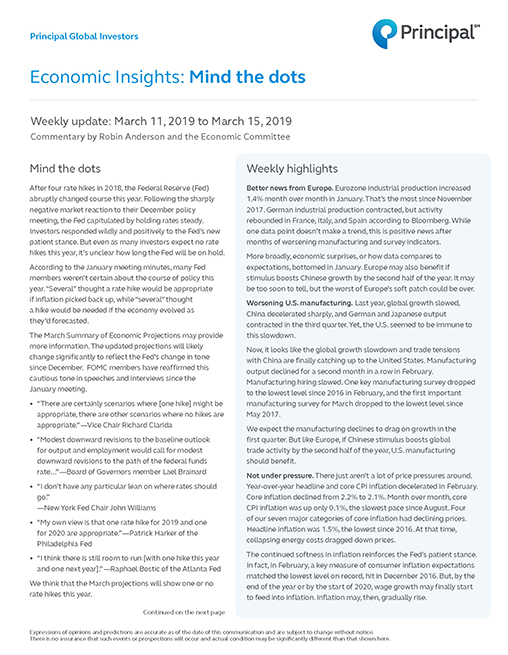 Markets may react to the updated Summary of Economic Projections this week if the changes signal a downside surprise. Click above to read the entire update.